If I mention the name “Betsy Ross”, what do you think of? This Philadelphian seamstress has become an American legend for her role in creating our flag. But what’s myth and legend? And what’s truth regarding this remarkable woman? First, let’s identity a few myths that AREN’T true! Betsy Ross was the only flag maker during the war. Betsy Ross was a close friend of General Washington. 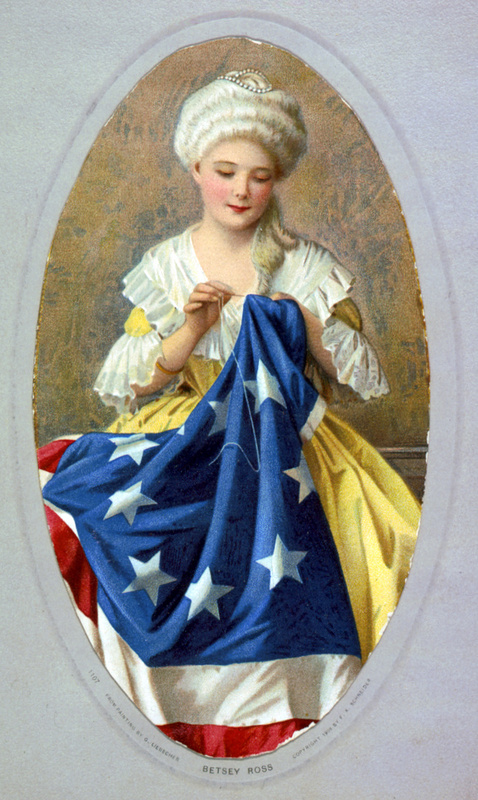 Betsy Ross was famous during the war era for designing and making flags. Betsy Ross was the master-mind behind the design of the American flag. What did Betsy Ross look like? We haven’t discovered any contemporary portraits or sketches from the 1770’s, but this photograph (taken in Colonial Williamsburg, 2008) gives an idea of the clothing and appearance of a business woman in Colonial America. Born in 1752, Betsy Griscom grew up in Philadelphia, Pennsylvania, in a large Quaker Family. She attended school, and in her teen years was apprenticed to learn the upholstery trade. Upholsterers created many useful items for the home, including bed linens, Venetian blinds, curtains, floor coverings, umbrellas, and other household items. Good design and sewing skills were necessary in the trade. While completing her apprenticeship, Betsy fell in love with John Ross who also worked in the upholstery shop. John Ross was not a Quaker and the Griscom Family disapproved of Betsy’s friend. In 1773, Betsy eloped with John Ross and they were married outside Philadelphia; her family disowned her. John and Betsy Ross started their own upholstery shop. John was part of the local militia and when the War for Independence began in 1775, the shop began manufacturing tents, uniforms, and other sewn supplies for the local unit. Tragedy came to Betsy’s busy life. John Ross died. 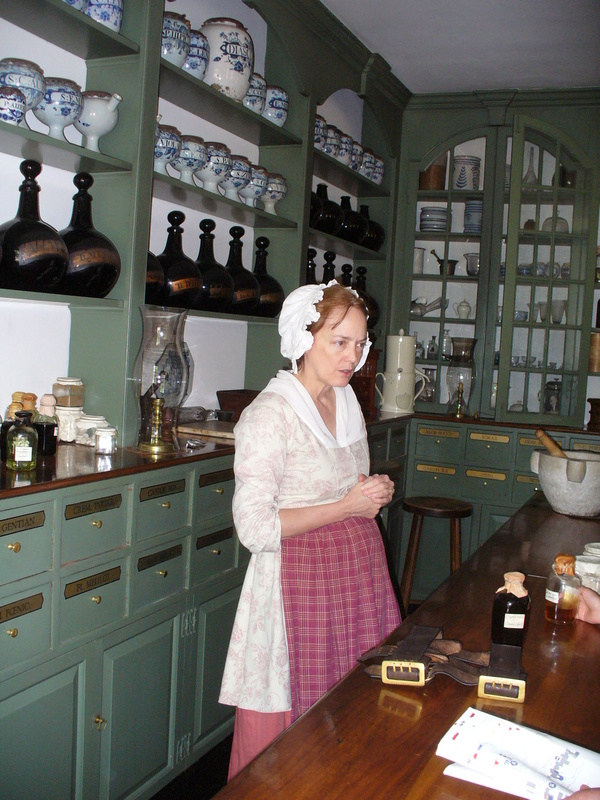 Continuing with the work they had started, Betsy kept the shop open and continued making supplies for the militia. She sewed tents, blankets, flags, and other items. Likely, Betsy did this work with a patriotic spirit (after-all, her husband had served in the patriot militia), but it was also good business for her; the shop provided a way for her to stay financially independent and retain societal respect for running a proper establishment. In 1777, Betsy married Joseph Ashburn, a mariner who fought to the American cause at sea. Unfortunately, Mr. Ashburn was captured and sent to a British prison ship where he died in 1782. Betsy Ross Ashburn was again a widow. She was also a mother; her first daughter died of a childhood illness, and her second daughter was born shortly before she learned about Joseph Ashburn’s death. A year later, Betsy married John Claypoole, a Quaker who supported the American cause. They would live happily for many years and have several children. During the war years, Betsy did make American Flags. Records show that Betsy Ross received a large sum of money for making flags; she was paid by the Pennsylvania State Navy Board. It makes sense that Betsy would’ve taken the sewing work that was available, and, if it helped the patriot cause, all the better. However, she was not commissioned as an official flag maker; Betsy Ross simply made flags as part of her work. Nor is there any positive record that she designed any banners. The British Army made headquarters in Philadelphia, and Betsy would’ve had to be extremely careful that the enemy soldiers didn’t find out about her sewing for the war effort. When I visited the Betsy Ross Home in Philadelphia several years ago, I was told that Betsy had British soldiers quartered in her home and she did some of her patriotic sewing in secret. We haven’t found any diaries by Betsy Ross. She would’ve know how to read and write, but she was a working woman. She probably didn’t have time to keep a journal or write many letters. She would’ve worked from early morning until late night in her shop or doing tasks around her home. 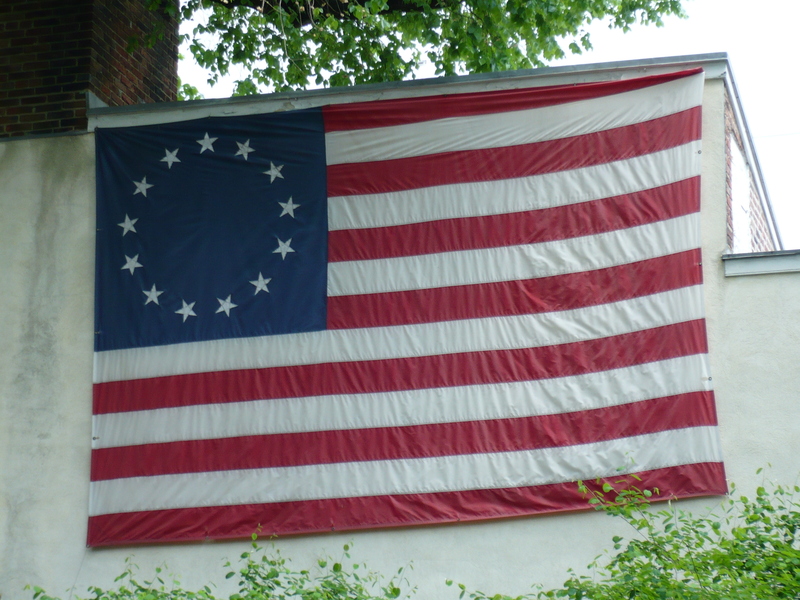 However, in the late 1870’s one of Betsy Ross’s descendants starting telling a family story of how George Washington, Robert Morris, and George Ross visited the upholstery shop in 1776, bringing the design of the American flag. Supposedly, Betsy suggested 5-point starts, rather than the 6-point stars in the drawing, and then agreed to try to make the flag. Since this story is oral-tradition, handed down for several generation, there will always be some level of skepticism surrounding it. However, George Ross – John Ross’s uncle – was on the flag committee of Congress. It is very possible that the facts of the story are true, but we’ll never be absolutely certain about all the details. Whether she made the first American stars and stripes or not, Betsy Ross was a remarkable woman. She ran a business in Colonial American – first with her husband, then on her own. She supported the patriot war effort and survived the winter when the British occupied the city. While it is highly unlikely that Betsy Ross looked like the overly idealized images that were created in the late 1800’s, she did have a patriotic spirit. She met the challenges of life and supported her country. In some ways, Betsy Ross’s story gives a name to countless other women who worked, sewed flags, and supported from the homefront; but this should not diminish Betsy Ross Ashburn Claypoole’s legacy of crafting tents, blankets, and flags for the American cause. Great article Sarah! I learn something new every time I read your posts. Great post again Sarah! I learn something new every time I read one. Thanks for sharing! Thanks Jim. Glad you enjoyed the article. Great post Sarah! I always learn something new from your articles. Sorry, I didn’t see my first post. Guess I liked it twice as much!